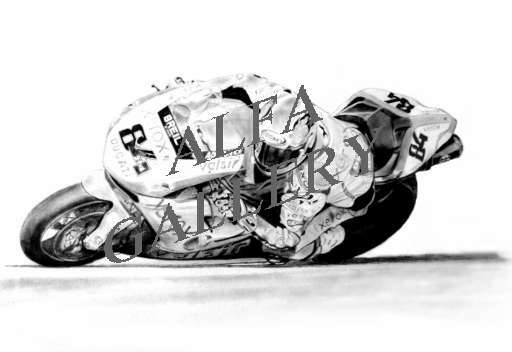 Please Note - In order to try and protect the copyright of these paintings and pencil drawings they are not necessarily reproduced here in crystal clear quality. 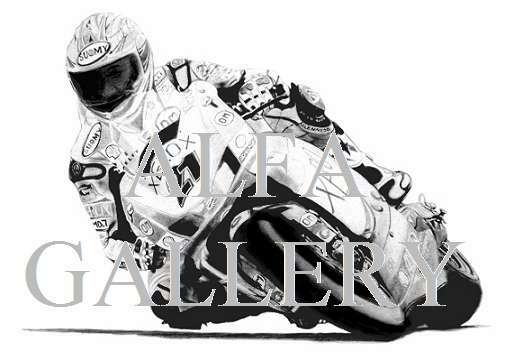 Prints are available for all paintings and drawings including special Limited Editions of canvas prints. See below for details of all available types of prints. Noriuke Haga in typical style on board the F1198R during the World Superbikes 2009 season. 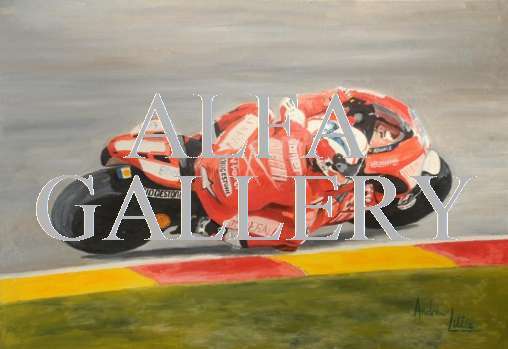 Casey Stoner winning the Italian GP at Mugello in 2009 - Ducati's first victory at their home track. Michel Fabrizio on his way to winning his first World Superbike race. 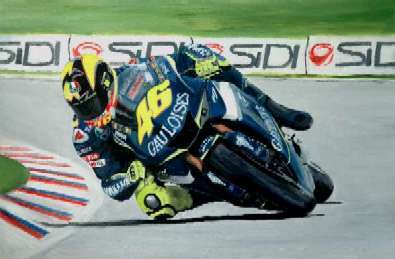 Race 2, Imola 2009. 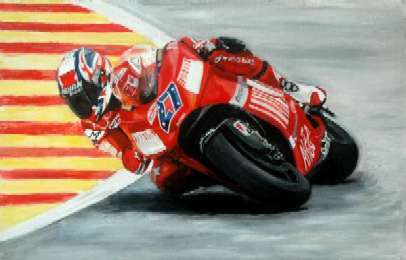 The legend that is Troy Bayliss - Triple World Superbike Champion in 2001, 2006 and 2008 - in typical style on the Ducati F07 999R. Niccolo Canepa - 2007 Superstock 1000 F.I.M. 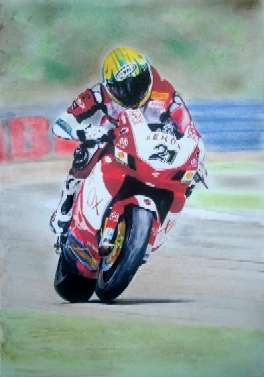 Cup Champion - on board the Ducati 1098S and winning on its debut at Donington Park in April 2007. Casey Stoner throws up a rooster-tail of spray during a wet Friday practice for the Mugello round of the 2007 MotoGP Championship. Troy Bayliss at speed during the Silverstone round of the World Superbike Championship 2006 - by the end of the year he was the Champion. 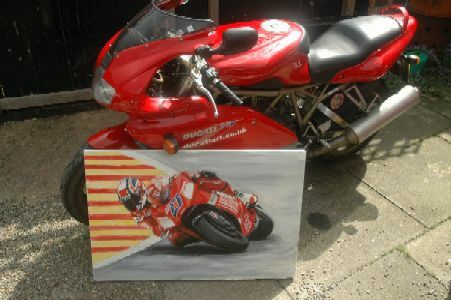 To give some idea of the size of the painting, here is a photograph of the original next to my Ducati. This photo of the same bike was taken outside the Ducati factory in Bologna whilst I was en route to Mugello for the research for the painting - and to enjoy the racing!. 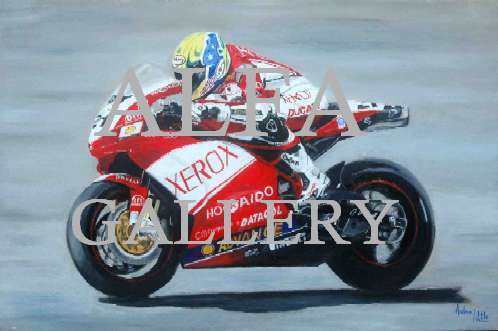 Technically not a Ducati subject but, surely, Valentino Rossi is the greatest rider never to ride for Ducati. 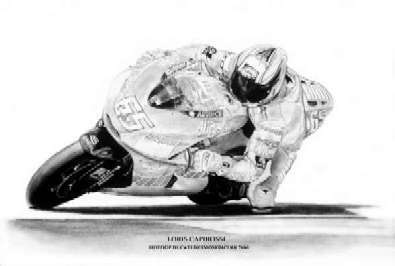 Here he is at the Czech Grand Prix in Brno on his way to the 2005 World Championship. 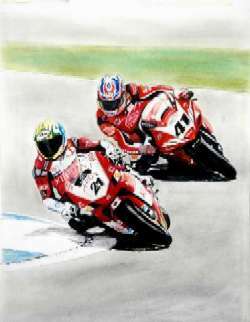 Troy Bayliss and Noriyuki Haga battling for honours - Silverstone WSBK 2006. 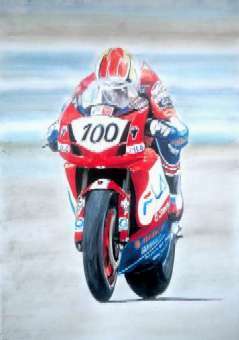 Neil Hodgson in full flight - WSBK 2003. 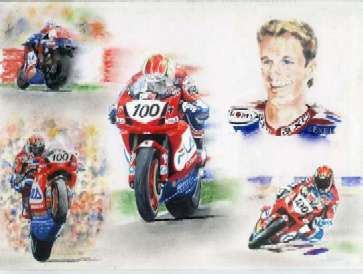 A montage of my artwork celebrating Neil Hodgson's 2003 World Superbike Championship winning season. Troy Bayliss at Silverstone on his way to the seventh of eight consecutive WSBK wins on the 999 in 2006. Loris Capirossi on the MotoGP Desmosedici RR - 2006. The same artwork of Loris but with the Marlboro logos added. Each of these paintings and drawings is available as part of special Limited Editions of that artwork. They are printed on to canvas and are virtually the same as the original. They are large formatt, approximately 36" x 24" but this varies depending on the size of the original print. 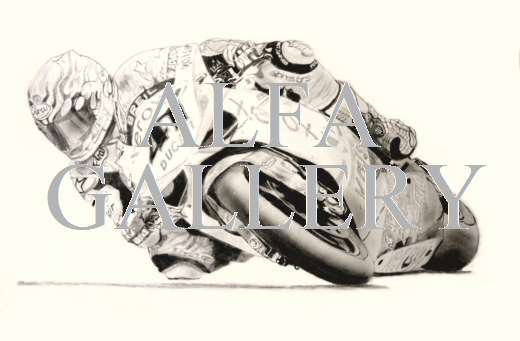 The individual print is numbered and signed by the artist and is limited to 100 prints worldwide. They are sold unframed and the cost is £180. The price does not include postage or packing. An impression of the size and quality can be seen in this photograph taken during my recent exhibition in Bologna, Italy. 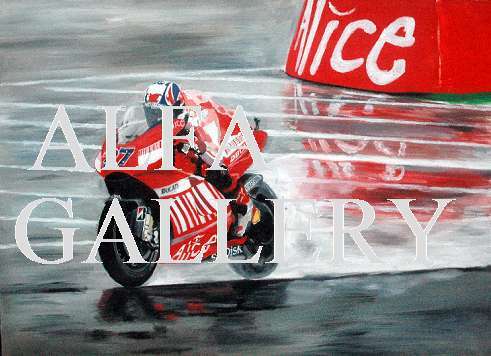 The end one on the right is the original painting of Casey Stoner in the wet at Mugello whilst the other three are canvas prints of originals. 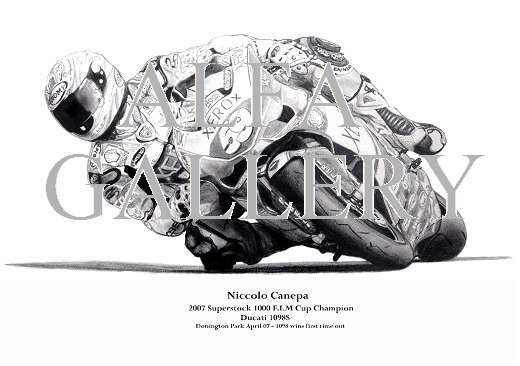 In addition to contacting me direct, the Ducati Manchester store has kindly agreed to display these canvas prints and they can also be purchased at the store. 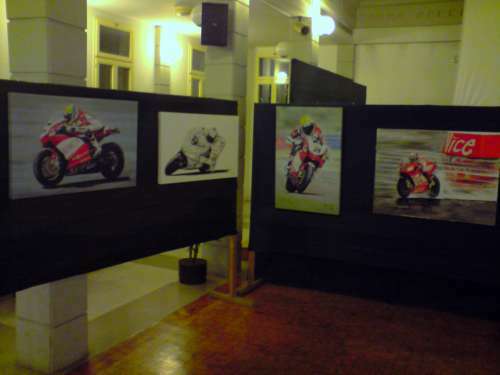 They are also available as high quality A3 prints (420mmx297mm, 16¾"x11¾"). All prints are individually signed by the artist. These high quality paper prints cost £9.95 each inclusive of UK post and packing. Additionally, in certain circumstances (depending on the distance involved and whether it fits in with my regular journeys), they can be supplied mounted, framed and protected by glass for £30 - free delivery. The HTML code for this page has been validated by the World Wide Web Consortium.